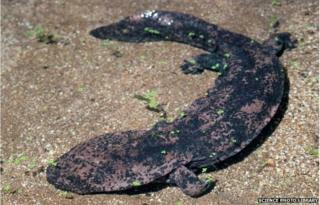 Chinese authorities are investigating allegations that senior security officials ate a critically endangered giant salamander at a lavish banquet. A local newspaper said journalists it sent to the restaurant to report on the meal were later beaten up as they photographed guests leaving. The meal reportedly took place in the southern city of Shenzhen last week. At least 14 policemen have been suspended over the incident, local media report. Officials have been discouraged from holding expensive feasts under President Xi Jinping's austerity and anti-corruption drive. China last year also approved stricter penalties for people caught eating rare wild animals, with offenders jailed for up to 10 years. The Southern Metropolis Daily published an extensive report (in Chinese) on Monday documenting the incident. The paper said that last Wednesday it received a tip-off that about 28 people, including senior public security officials, were using public funds to pay for a banquet that night, where they would be eating the endangered salamander. It sent two reporters and a photojournalist, who managed to sneak into the restaurant and from outside the private dining room reportedly overheard the party host boasting that he wanted to give guests "a special treat". A dinner guest later confirmed with the paper that they were served a giant salamander which the host had brought for the party. Chinese giant salamanders, which can grow to nearly 180cm (5.9 ft), are critically endangered and a protected wildlife species in China, but are also considered a delicacy. The meal reportedly cost 6,352 yuan (£673; $1,015). Guests were also seen being given bags of fish as they left. An official was heard saying the fish were taken from a reservoir where fishing is prohibited. The situation turned violent when the officials realised that the photojournalist was taking their pictures as they left the restaurant and confronted him, said the paper. The two reporters were also surrounded by the officials and security guards. The journalists were allegedly beaten up and throttled, and their equipment and phones were stolen. State news agency Xinhua later reported that 14 police officers were suspended from duty, though said it was not clear whether they had been at the meal or arrived because of the clashes. A local police chief was also under investigation, said Xinhua. Local authorities have also convened a team to investigate the incident, though one public security chief has claimed that the party had been paid for by a retired official.